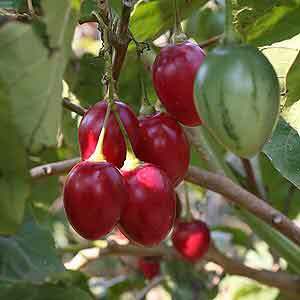 The Tamarillo is a useful and very attractive small tree for the edible garden; fast growing, fruits within 18 months and bears a heavy crop each year. It has large, heart-shaped leaves and the bright fruit decorates the tree beautifully. Tamarillos grow well in temperate climates, protected from frost and wind. My tree has thrived for years in the Dandenong Ranges in a sheltered spot that gets the morning sun. Plant in light well-drained soils. They have shallow roots, so mulch well and water during dry spells. Tamarillos grow to about two metres. They are fast growing and fruit well by the second year. The flowers grow in attractive pink clusters. When they are about a metre tall, it is a good idea to prune the tree so strong branches develop to bear the clusters of fruit. A low maintenance fruit tree that is a pleasure to have in the garden. 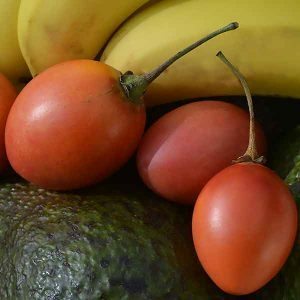 Tamarillo fruit are shiny, egg-shaped, in bright colours from deep red to yellow. They look fabulous in the fruit bowl, or sliced on the cheese platter. They can be eaten raw with a spoon, pureed for dessert toppings, stewed, used in curries and casseroles, baked, fried, or made into sauces and chutneys. The fruit is high in Vitamins A, B6 and C. The red fruit are the most exotic with a unique, tangy flavour. The amber and yellow fruit are sweeter and very delicious. Fruit ripens in autumn and winter. Pick the fruit when they are slightly soft, then let them ripen in the fruit bowl. The fruit will become sweeter after about week in the bowl. They also keep well in the fridge and each tree produces fruit from May until October. Enough to keep your friends and family happy for months!